The Iranian president says designating the IRGC as a terrorist organization by the United States is a mistake that shows Washington’s hostility, grudge, and disappointment towards Iran, and will just increase the popularity of the Islamic Revolution Guards Corps in Iran and the region. “This mistake will unite Iranians and the IRGC will grow more popular in Iran and the region,” Hassan Rouhani said on Tuesday. His comments came after Washington labelled Iran’s Islamic Revolution Guards Corps as a foreign terrorist organisation. Tehran took retaliatory action by naming the United States Central Command (CENTCOM) as a terrorist organisation and the US government as a sponsor of terror. Rouhani defended the IRGC as protectors of Iran saying that the IRGC members have sacrificed their lives to protect people, and (1979) revolution. 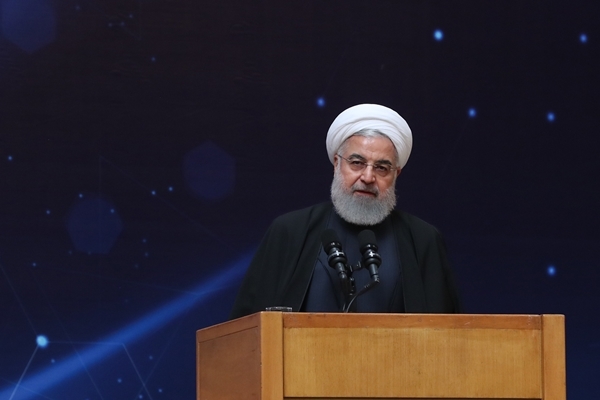 “Who are you to label revolutionary institutions as terrorists?” Rouhani asked in an address to a conference marking the country’s Nuclear Technology Day. “You want to use terrorist groups as tools against the nations of the region. You are the leader of world terrorism,” he said. Rouhani said this unprecedented step will heighten tensions in the Middle East. He hailed the moves by the IRGC in the region underlining that the military force helped countries in the region like Syria and Iraq in recent years to defeat ISIS. He further pointed out that the move cannot hamper the Islamic Republic’s military or technological progress. “I am telling you, if you pressure us, we will mass produce IR-8 advanced centrifuges,” Rouhani said, addressing US leaders.